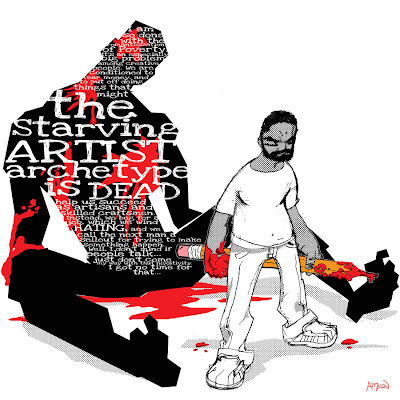 Samax Amen wrote a powerful post last week about 3 Steps to Killing the Starving Artist. What drew me in wasn't even the words at first. It was seeing the image on Facebook. Friday, I had the opportunity to speak to high school students. At the end of one of the sessions a young artist asked, "Are there ways for artists to make money?" Sadly, my first thought was that artists are typically "terrible businessmen." Many artists struggle because there is so much of "them" in their art. It can be a really painful process to put your work in the marketplace and have it treated it like a product rather than a piece of yourself. The thing is that it doesn't have to be that way. As Samax identifies, in many ways it is simply an idea that artists have bought into. Samax's piece struck a chord with many, because it went viral. If this resonates with you, too, you can purchase the print via PayPal in any of the sizes below. For the record, I don't make any money on this. I just lifted the link from Samax's website so I could share it with you!